With 2014 Election Day set to begin, here are some final thoughts on who replaces Governor Gump. All eyes will be on the race for governor and the really big question is " did Gina blow it?" Raimondo overspent in the primary and found herself , for the first time, at a disadvantage in the game of money. Gina spent millions making herself likeable,( meatloaf, family bike riding, Gansett) only to destroy it all with the Planned Parenthood rally. Bishop Tobin when on the attack, La Salle tore down her plaque, and her commercials went " fade to black." Raimondo went into hiding for 3 weeks, but benefitted from a Fung Team that agreed to a late debate schedule instead of kicking things into gear in early October. 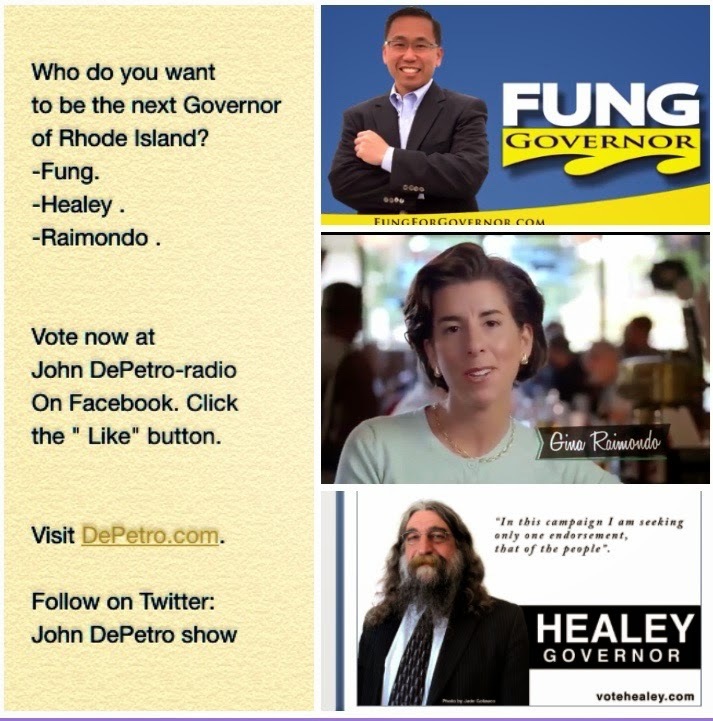 The Raimondo campaign watched their internal poll numbers tumble down and watched as undecided voters began to break to Fung. If Bob Healey were not in the race, it may have been Fung in a romp. But Healey is in the race, and picking up steam and momentum every minute. Animosity towards Gina Raimondo has reached epic perportions with comparisons to the " wicked witch" to a Wall Street insider and anti-Christ. Mayor Fung has not run a great campaign but he has not run a bad campaign. Fung has surged due to Gina morphing into " Myrth Yorke. "With the exception of the CH 12, Raimondo also benefitted from a few weak TV " debates" that basically repeated the same questions we have heard since May with no surprises and questions that played to her strengths. The President Obama visit did little to help, and may have hurt Gina with male independent voters. I expect a low voter turnout and if the Fung campaign spend their money properly, they should do well in Warwick, Cranston, Johnston, and North Providence. In Providence, the Cianci voter is not a Raimondo voter. This race has all the makings of an upset.